Central location. I stopped by, but no new ticks for me there, so I went on. The place is probably fair enough if you need some of the regular beers. A decent locals pub, got a bit of Parachute regiment and Royal marine memorabilia oin the walls which is interesting, beer was decent but the location is not the best... Interesting to sit outside and do some people watching of the customers in the Mcdonalds opposite. Has this pub changed hands? Looks like it's had a make-over and some of the old pictures and bric-a-brac appear to have gone. Only one beer on draught which was fine (Skinners"Betty Stoggs"). 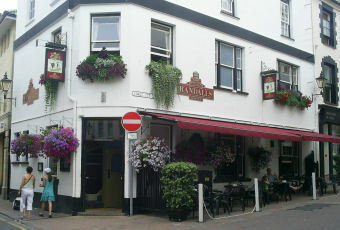 My favourite pub in Jersey on my recent tour of the Beer Guide pubs. A real boisterous locals pub but friendly enough and the Skinners beer (only saw Betty Stogs) was the best I tasted. Another visit and more Skinner's ales which very very good. Local trade mostly but the loud quiz machine was distracting. Still worth a visit when in town.